And now, on to the nails! 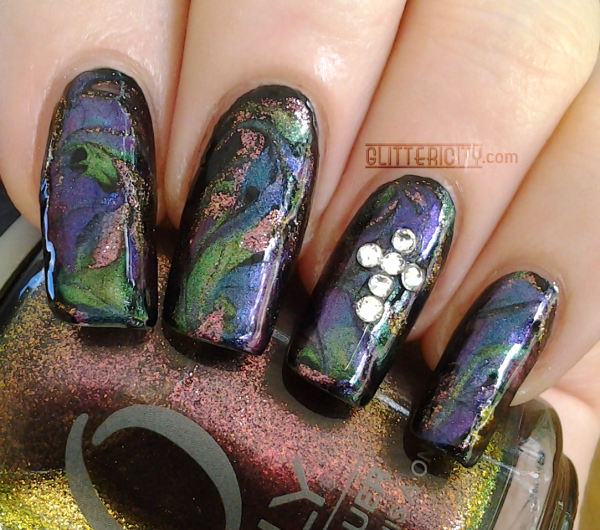 I was aiming for a gem-like appearance, swirling duochrome polishes over a black base. Like my last design, it didn't work out quite the way I'd envisioned, but I still really like the result! The base is two easy coats of Soulstice Spa Gotham, standard black creme. 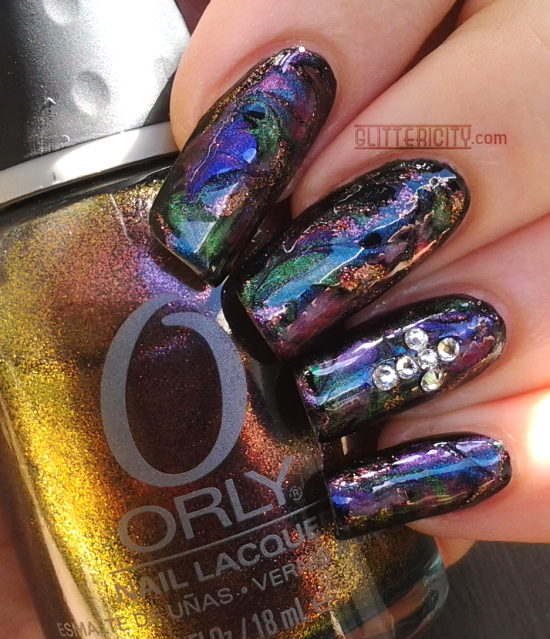 While that was wet, I dabbed on spots of four different duochromes: Orly Space Cadet (pictured above), and Ozotic 503, 504, & 505. 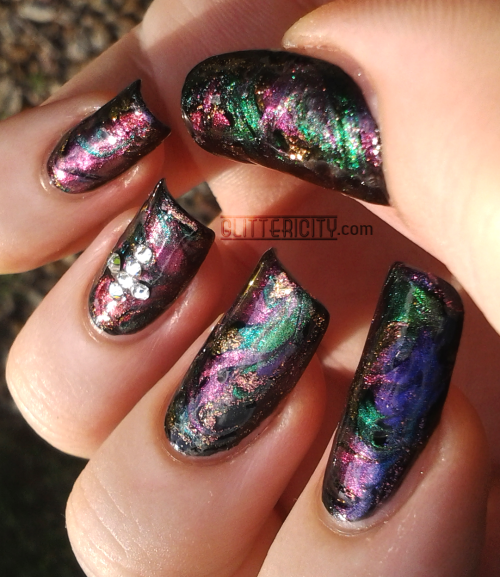 I used a thin striping brush to swirl the dots together a bit, marbling them without getting them too melded together. 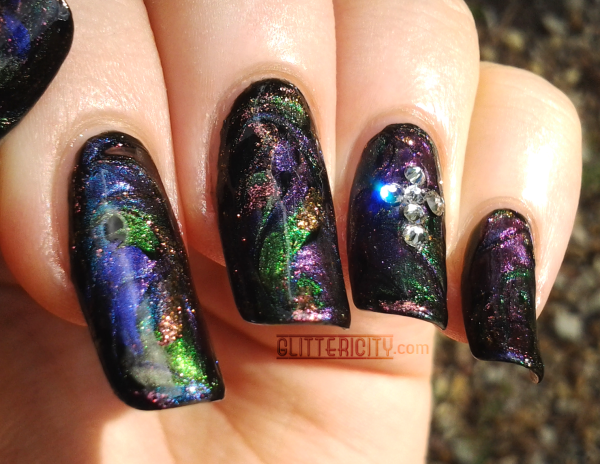 Topcoated with KBShimmer Clearly On Top. I wanted to brighten up the look without covering much of the design, so I did a simple cross shape with some 1mm Swarovski crystals on the ring finger. 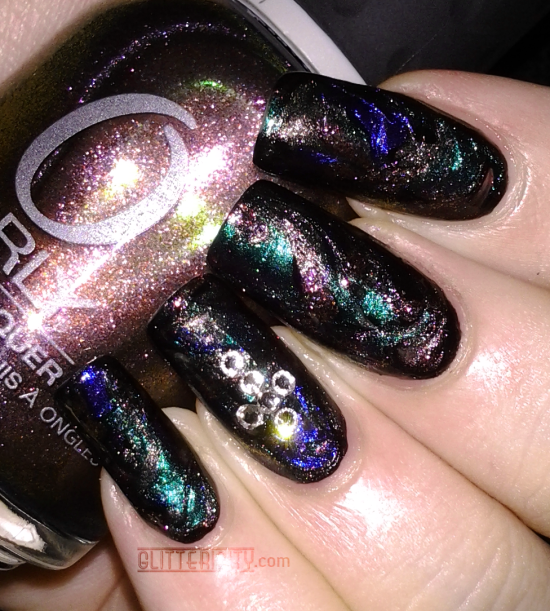 I pushed them into the topcoat and didn't put anything over it, fearing I'd ruin the gorgeous sparkle of these diamantes. Hopefully they stay on for a while! Ozotic 505 is amazing, you guys. 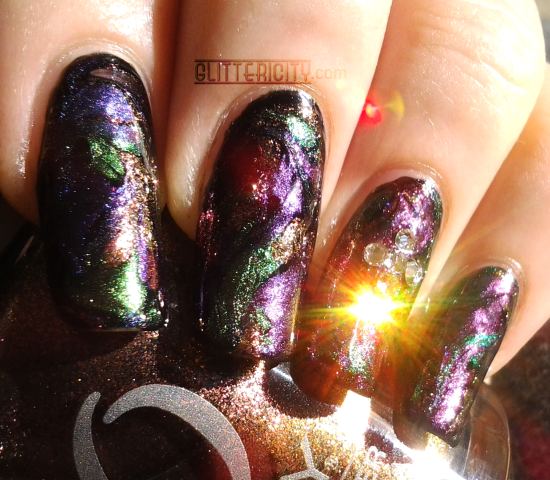 They all are--Space Cadet is sooo bright and sparkly in addition to the strong red-gold-purple shift!--but oh em gee. Alone, 505 is practically transparent. Nothing. A faint smear. But over black, it transforms into a beautiful brilliant explosion of electric blue, teal, gold, green, purple... it is a polish-lover's dream. Indoors with flash. Not the best lighting for this particular mani. This manicure is even more eye-catching in real life. I wish a camera existed that could properly show off duochromes!